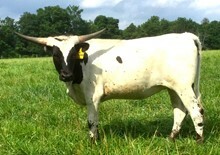 585 Deluge has been a very productive Longhorn cow over the course of her lifetime. We have had her in our breeding program for quite a while and she has never disappointed us. Just take a look at her progeny. We are selling her, looking for a new home to someone that will understand her powerful pedigree and production record. She is getting to be an old cow, so we realize we have to sell her now or never.